Mobile Computing | The Encyclopedia of Human-Computer Interaction, 2nd Ed. One of the things that makes mobile computing an interesting topic of research and design is that the area is strongly driven by innovation, characterised by rapidly evolving use, and has enormous market potential and growth. New technologies are constantly being developed, new use domains are constantly being explored, and successful new ideas and applications reach millions of users. In fact, by the end of 2010 more smartphones than personal computers were, for the first time, being sold worldwide, with more than 100 million units shipped in the last three months of that year alone. Reflecting this dynamic and rapidly evolving nature of the area, the industrial lead position has been passed on several times within only a decade, from Palm to Nokia to Apple, and is most likely to be passed on again in the future. This obviously motivates researchers and designers to keep innovating and developing new technology and applications. A primary driver of mobile technology development has been the enormous uptake of interactive systems and devices for work as well as for leisure. Mobile phones have long been something almost everyone owns at least one of and uses extensively for personal purposes and not just for work. With Internet and multimedia-enabled phones such as the Apple iPhone, smart phones have now firmly reached this mass market too and are no longer something exclusively for a small elite of business professionals. The uptake of mobile technology in our work and private spheres has had a huge impact on the way we perceive and use these technologies. They are no longer just computers on batteries. They have become functional design objects, the look, feel and experience of which we care deeply about, and that we juggle in multitude in our everyday lives. Mobile computing is a relatively new field of research with little more than three decades of history. During its lifetime, it has expanded from being primarily technical to now also being about usability, usefulness, and user experience. This has led to the birth of the vibrant area of mobile interaction design at the intersections between, among others, mobile computing, social sciences, human-computer interaction, industrial design, and user experience design. Mobile computing is a significant contributor to the pervasiveness of computing resources in modern western civilisation. In concert with the proliferation of stationary and embedded computer technology throughout society, mobile devices such as cell phones and other handheld or wearable computing technologies have created a state of ubiquitous and pervasive computing where we are surrounded by more computational devices than people (Weiser 1991). Enabling us to orchestrate these devices to fit and serve our personal and working lives is a huge challenge for technology developers, and “as a consequence of pervasive computing, interaction design is poised to become one of the main liberal arts of the twenty-first century” (McCullough 2004). The field of mobile computing has its origin in a fortunate alignment of interests by technologists and consumers. Since the dawn of the computing age, there have always been technological aspirations to make computing hardware smaller, and ever since computers became widely accessible, there has been a huge interest from consumers in being able to bring them with you (Atkinson 2005). As a result, the history of mobile computing is paved with countless commercially available devices. Most of them had short lifespan and minimal impact, but others significantly pushed the boundaries of engineering and interaction design. It is these devices, and their importance, that I wish to emphasize here. The history of mobile computing can be divided into a number of eras, or waves, each characterised by a particular technological focus, interaction design trends, and by leading to fundamental changes in the design and use of mobile devices. In my view, the history of mobile computing has, so far, entailed seven particularly important waves. Although not strictly sequential, they provide a good overview of the legacy on which current mobile computing research and design is built. The era of focus on Portability was about reducing the size of hardware to enable the creation of computers that could be physically moved around relatively easily. Miniaturization was about creating new and significantly smaller mobile form factors that allowed the use of personal mobile devices while on the move. Connectivity was about developing devices and applications that allowed users to be online and communicate via wireless data networks while on the move. Convergence was about integrating emerging types of digital mobile devices, such as Personal Digital Assistants (PDAs), mobile phones, music players, cameras, games, etc., into hybrid devices. Divergence took an opposite approach to interaction design by promoting information appliances with specialised functionality rather than generalized ones. The latest wave of apps is about developing matter and substance for use and consumption on mobile devices, and making access to this fun or functional interactive application content easy and enjoyable. Finally, the emerging wave of digital ecosystems is about the larger wholes of pervasive and interrelated technologies that interactive mobile systems are increasingly becoming a part of. 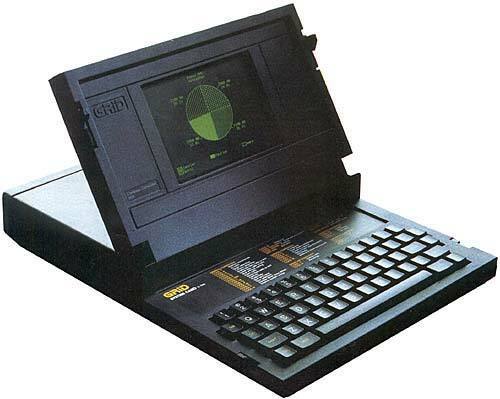 The first mobile computers, the precursors to present time’s laptops, were developed in the late 1970s and early 1980s inspired by the portability of Alan Kay’s Dynabook concept from 1968 (Kay 1972). The Dynabook concept was originally thought of as a machine for children, but observant entrepreneurs, such as the founder of GRiD Systems, John Ellenby, quickly realised that the starting point for something that innovative would have to be “the customer with the most money and the most demanding need” (Moggridge 2007). Author/Copyright holder: GRiD Systems Corporation;Alan C. Kay. Copyright terms and licence: All Rights Reserved. Used without permission under the Fair Use Doctrine (as permission could not be obtained). See the "Exceptions" section (and subsection "allRightsReserved-UsedWithoutPermission") on the page copyright notice. 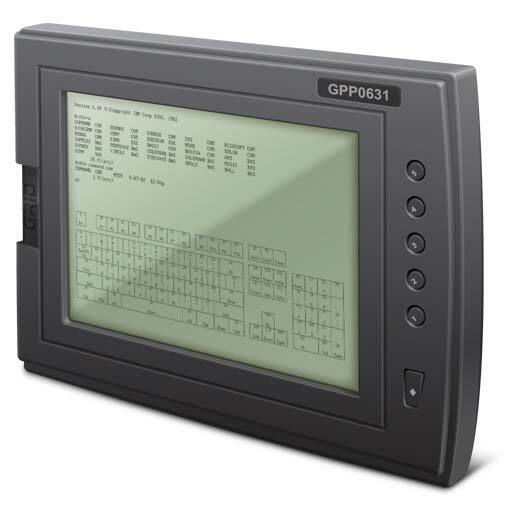 The first laptop computer was the GRiD Compass 1101 designed by Bill Moggridge as early as 1981 in response to the design brief of fitting within half the space of a briefcase (Moggridge 2007; Atkinson 2005). The Compass had a 16MHz Intel 8086 processor, 256K DRAM, a 6-inch 320x240 pixel flat screen display, 340kb bubble memory, a 1200 bit/s modem, weighed 5 kg, and ran its own graphical operating system called GRiD OS. It was primarily sold to the U.S. government and was, amongst others, used by NASA on Space Shuttle missions during the early 1980s, and in combat. The GRiD Compass featured a stunning forty-three innovative features in its utility patent, including the flat display and hinged screen. 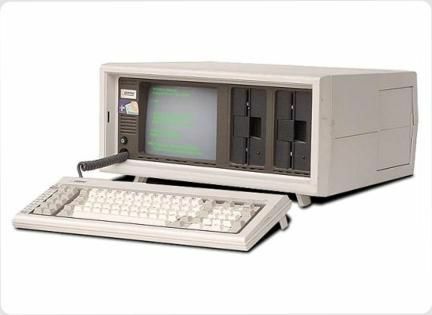 The first portable computer to reach real commercial success, however, was the suitcase-style Compaq Portable from 1982, which as the first official IBM clone could run MS-DOS and standard PC programs. In 1988, Grid Systems also developed the first tablet computer, the GRiDpad, initiated and led by Jeff Hawkins who later designed the first PalmPilot and founded Palm Computing. In terms of design longevity and impact, Bill Moggridge’s work on the first laptop computer and Jeff Hawkins’ work on the GRiDpad illustrates the value of careful and well-considered interaction design in mobile computing. The GRiD Compass was superior in terms of its design and performance for a decade. It defined the folding design still used in today’s laptops 30 years later, and its basic form factor was not surpassed until the Apple PowerBook 100 introduced the, now standard, clam-shell design and integrated pointing device in 1991. The basic design of the GRiDpad paved the way for tablet computers and handheld devices such as the Apple Newton, the PalmPilot, and even the iPad. Author/Copyright holder: Compaq Computers. Copyright terms and licence: All Rights Reserved. Used without permission under the Fair Use Doctrine (as permission could not be obtained). See the "Exceptions" section (and subsection "allRightsReserved-UsedWithoutPermission") on the pagecopyright notice. Author/Copyright holder: GRiD Systems Corporation. Copyright terms and licence: All Rights Reserved. Used without permission under the Fair Use Doctrine (as permission could not be obtained). See the "Exceptions" section (and subsection "allRightsReserved-UsedWithoutPermission") on the page copyright notice. By the early 1990s, the size of computer hardware had reached a point that allowed radically new and smaller form factors of mobile computers to evolve and emerge on the market. These predominantly handheld devices were labelled palmtop computers, digital organizers, or “Personal Digital Assistants” (PDAs). PDAs differed from laptop PCs by being truly mobile and something that the users could operate while actually moving around physically. They were not thought of as alternatives to desktop or laptop computers, but rather as small and lightweight supplemental devices for busy businessmen spending some of their time away from their PC. 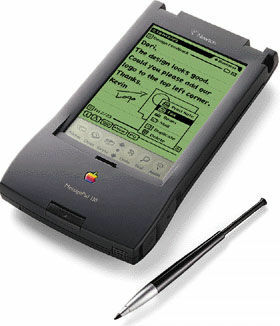 The first PDA was the Apple Newton from 1992. 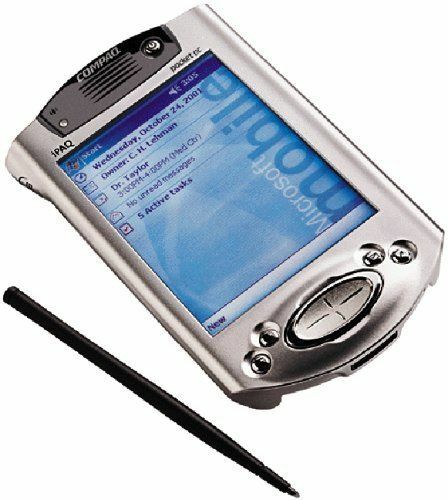 In 1997, the first PalmPilot was introduced, and in 2000 Compaq released the iPAQ Pocket PC. Whereas the focus of laptop computing was predominantly on portability and mobile access to documents and applications available on desktop computers, palmtop computing introduced an additional focus on applications and interaction styles designed specifically for mobile devices and mobile users. The PDA generation of mobile devices represented a number of distinct interaction design choices and form factors. 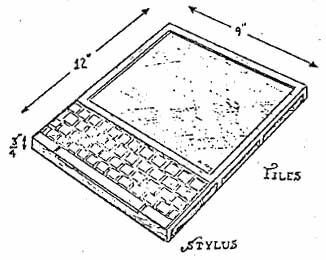 Most notably, they introduced the combination of a relatively small touch-sensitive screen and a separate pen (or stylus) for user interaction. Using the stylus, the user could interact with content directly on the screen and enter text via an on-screen keyboard or through handwriting recognition software. Other interaction design innovations included function buttons for accessing pre-defined applications and functions, navigation keys for operating menus, and the “one-click” dock for synchronizing with a stationary computer and for charging. 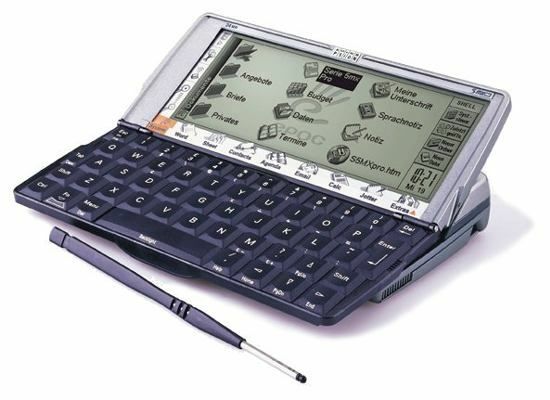 While the Psion series 3 to 5 replicated a “laptop in miniature” design, the Newton, PalmPilot and iPAQ all represented a fundamentally new mobile computing form factor where the majority of the device’s surface was used for its display. 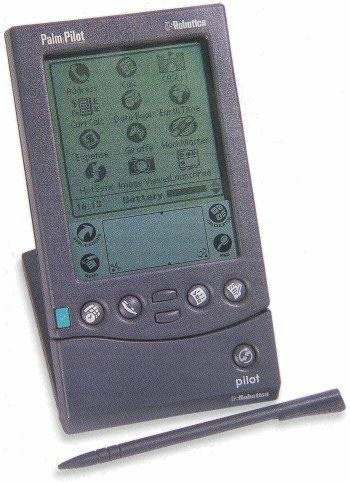 In terms of interaction design, the PalmPilot in particular was a product of careful and detailed rethinking of the emerging class of handheld computers; what they should look and feel like, what functions they should perform, and how they should perform them. As an example, the creator of the PalmPilot, Jeff Hawkins, later explained how he carried blocks of wood with him in different sizes and shapes until he had reached the perfect physical form for the device (Bergman and Haitani 2000). Author/Copyright holder: Palm Inc.. Copyright terms and licence: All Rights Reserved. Used without permission under the Fair Use Doctrine (as permission could not be obtained). See the "Exceptions" section (and subsection "allRightsReserved-UsedWithoutPermission") on the page copyright notice. Author/Copyright holder: Psion. Copyright terms and licence: All Rights Reserved. Used without permission under the Fair Use Doctrine (as permission could not be obtained). See the "Exceptions" section (and subsection "allRightsReserved-UsedWithoutPermission") on the page copyright notice. With the emergence of PDAs came also new categories of applications developed specifically for mobile devices and users. The devices each had their own operating systems, optimized for their particular screen sizes and input capabilities, and a suite of standard applications for calendars, contacts, note taking, and email. Adding to this, a wide range of 3rd party applications soon became available for purchase or, as something new, downloadable via the Internet. By the late 1990s, application development specifically for mobile devices was an acknowledged research area and profession, and in 1998 the first international workshop on Human-Computer Interaction with Mobile Devices (Mobile HCI’98) was held in Glasgow specifically addressing the emerging challenge of interaction design and user experiences for mobile devices, systems and services. The third wave of mobile computing had its origins in wireless telecommunication. As early as 1973, a Motorola team led by Martin Cooper developed and patented a handheld mobile phone concept that led to the first commercial mobile phone small enough to be carried, the DynaTAC 8000X, in 1983. Author/Copyright holder: Motorola. Copyright terms and licence: All Rights Reserved. Used without permission under the Fair Use Doctrine (as permission could not be obtained). See the "Exceptions" section (and subsection "allRightsReserved-UsedWithoutPermission") on the page copyright notice. 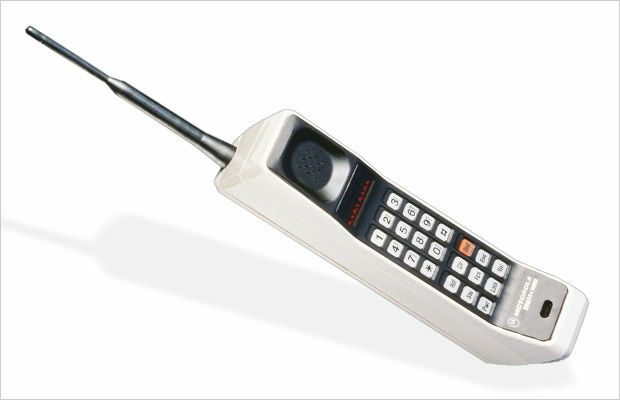 In the 1980s and early 1990s, mobile phones were not really considered to be computers. However, with the introduction of the digital Global System for Mobile Communications (GSM) mobile phone system in 1991, which also included the Short Message Service (SMS) communication component, the complexity and functionality of handsets began evolving rapidly. So did the uptake of mobile phone technology by the broad population worldwide. This meant that mobile phone developers were suddenly faced with a huge challenge of interaction design not only for making phone calls, but also for handling contacts, calendars, text-based messages, and browsing the Internet. 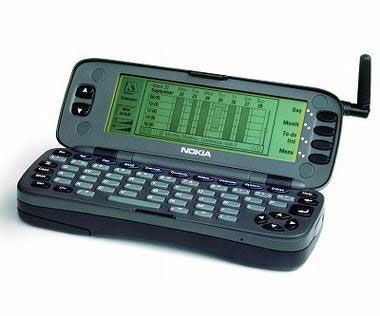 In the late 1990s, interaction design for mobile phones was unarguably dominated by the work at Nokia, which led to a series of ground-breaking handsets. The challenges of the time were to design for tiny low-resolution displays and for input capabilities limited to a 12-key numeric keypad alongside a small number of function and navigation keys. 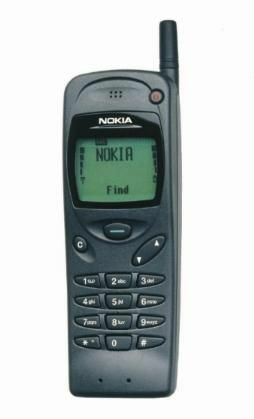 One of the first mobile phones explicitly resulting from a careful process of interaction design in the 1990s was the Nokia 3110. It introduced a simple graphical menu system and the “Navi-key” concept for simplifying user interaction — an interaction design that reached the hands of more than 300 million users through subsequent Nokia handsets (Lindholm and Keinonen 2003). In 1999, the basic interaction design of the Nokia 3110 was extended with T9 predictive text for SMS messaging, games, customisable ring tones, and changeable covers for the extremely successful Nokia 3210. Author/Copyright holder: Nokia. Copyright terms and licence: All Rights Reserved. Used without permission under the Fair Use Doctrine (as permission could not be obtained). See the "Exceptions" section (and subsection "allRightsReserved-UsedWithoutPermission") on the page copyright notice. In the late 1990s, the enormous, and completely unexpected, uptake of SMS inspired attempts to bring the Internet to mobile handsets too. This led to the development of the Wireless Application Protocol (WAP) allowing simplified websites to be viewed on small displays and paving the way for Internet access on mobile devices. 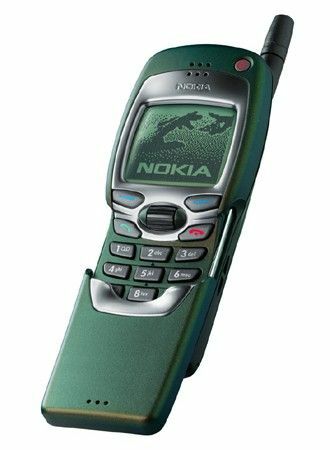 The first mobile phone to feature a WAP browser was the Nokia 7110. In response to the need for scrolling through long WAP pages it also featured the first “Navi-roller” thumb wheel. 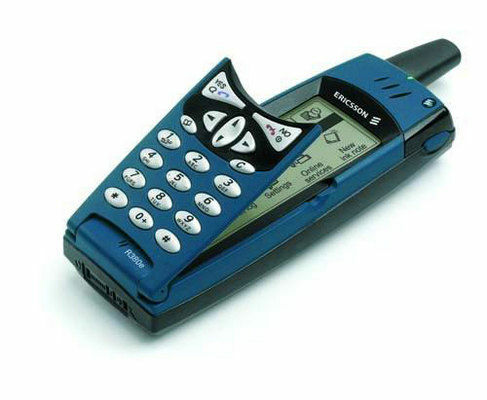 As an interesting example of interaction design, the 7110 also featured a spring-loaded cover concealing the keypad, which was inspired by the film The Matrix where the main character uses an earlier Nokia phone modified by the film’s production crew to have this functionality. “Life imitating art” (Wilde 1889) you could say. WAP, however, never lived up to the expectations due to slow data transfer and poor usability (Ramsay and Nielsen 2000; Nielsen 2000) and was soon superseded by access to the real web on mobile devices. Nevertheless, mobile phone design in the 1990’s had a fundamental and lasting impact on the future of mobile computing to come. One of the most interesting eras of mobile computing began when different types of specialised mobile devices began converging into new types of hybrid devices with fundamentally different form factors and interaction designs. The first phase of this was the emergence of “smart phones”, which combined the functionality of a PDA with that of a mobile phone. The development of smart phones involved exploration of a wide range of form factors and interaction designs and led to a series of innovative solutions. Many of these involved designs where the physical shape of the device could be changed depending on what the user wanted to use it for. 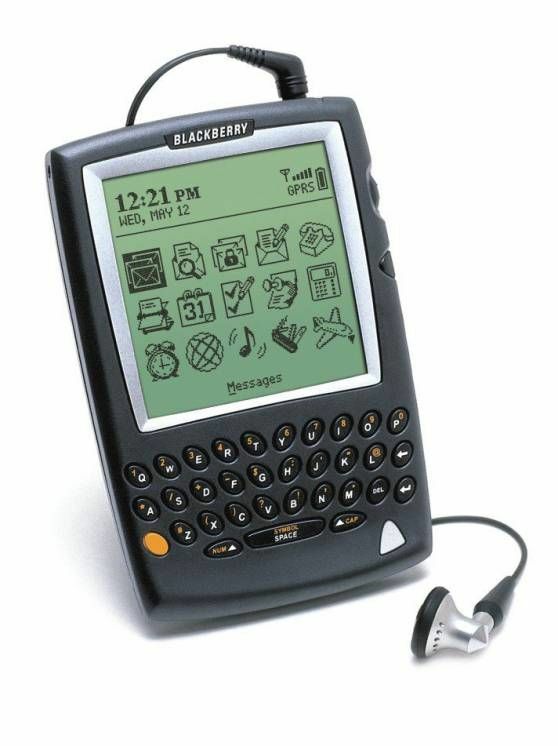 Other designs, like the Blackberry, introduced a “wide-body mobile phone” form factor with a PDA size display and a miniature QWERTY keyboard in place of the traditional 12-key numeric keypad. 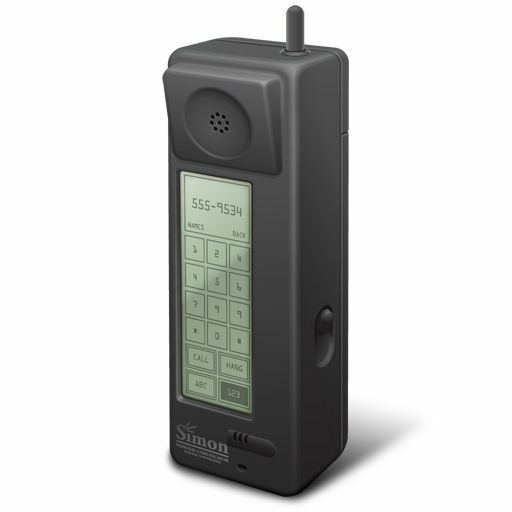 The first smart phone that, as well as making phone calls, could also be used for calendars, addresses, notes, e-mail, fax, and games was the IBM Simon from 1992. It had no physical buttons, but only a touch screen, which could be operated with a finger or a stylus. Author/Copyright holder: IBM. Copyright terms and licence: All Rights Reserved. Used without permission under the Fair Use Doctrine (as permission could not be obtained). See the "Exceptions" section (and subsection "allRightsReserved-UsedWithoutPermission") on the page copyright notice. Author/Copyright holder: Ericsson. Copyright terms and licence: All Rights Reserved. Used without permission under the Fair Use Doctrine (as permission could not be obtained). See the "Exceptions" section (and subsection "allRightsReserved-UsedWithoutPermission") on the page copyright notice. Author/Copyright holder: Blackberry. Copyright terms and licence: All Rights Reserved. Used without permission under the Fair Use Doctrine (as permission could not be obtained). See the "Exceptions" section (and subsection "allRightsReserved-UsedWithoutPermission") on the page copyright notice. The second phase of convergence combined mobile phones with various rich media capabilities, such as digital cameras, music players, video recording and playback, and television and radio reception. Whereas smart phones were attractive for business professionals’ work activities and productivity, multimedia phones were attractive for everyday people’s leisure, fun and socialising. Author/Copyright holder: Sharp. Copyright terms and licence: All Rights Reserved. Used without permission under the Fair Use Doctrine (as permission could not be obtained). See the "Exceptions" section (and subsection "allRightsReserved-UsedWithoutPermission") on the page copyright notice. Author/Copyright holder: Sony Ericsson. Copyright terms and licence: All Rights Reserved. Used without permission under the Fair Use Doctrine (as permission could not be obtained). See the "Exceptions" section (and subsection "allRightsReserved-UsedWithoutPermission") on the page copyright notice. The most notable example of convergence for leisure was the invention of the camera phone. 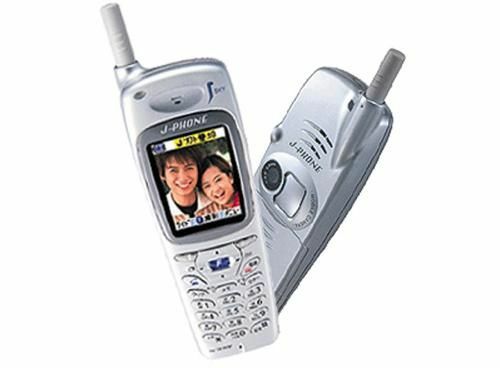 The first mobile phone to feature a digital camera was the Sharp J-SH04 from 2001. It was only available in Japan through the i-mode mobile Internet service, but the rest of the world soon followed. Two years later, more camera phones were sold than digital cameras, and in 2006 half the world’s mobile phones had a built-in camera — making Nokia the biggest brand of digital cameras and forcing prominent brands such as Minolta and Konica out of the camera business. By 2009, there were more than 1.9 billion camera phones in existence, and mobile phone photography had already had a huge social impact through new ways of capturing and sharing photographs over the Internet (cf. Kindberg et al. 2005; Gye 2007). Whereas early camera phones were clearly phones with cameras, novel interaction design led to several converged devices truly blurring the boundaries between the two (Murphy et al. 2005). 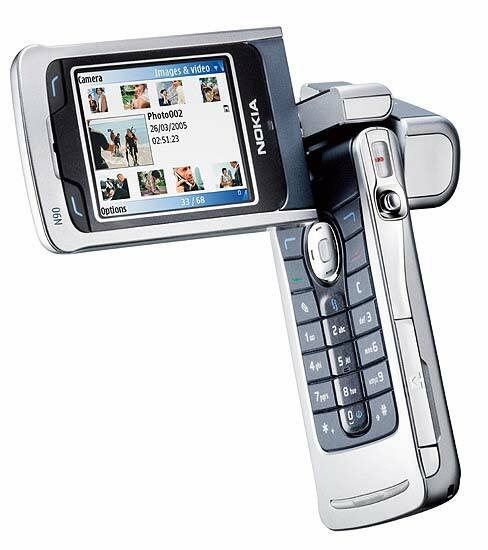 As an example, it can be hard to tell if the Nokia N90 is a phone or a camcorder. Another converged functionality to become widely available on mobile phones was the ability to listen to digital music. 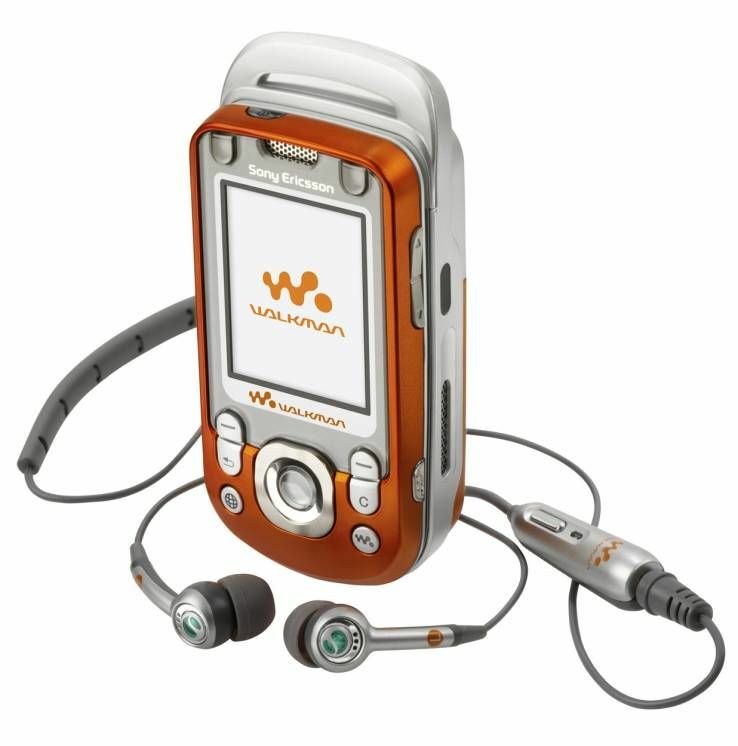 Most notably, Sony re-launched its successful “Walkman” brand of the 1980s in the shape of the converged Sony Ericsson W600 in 2005. With the W44 multimedia phone from 2006, they even went a step further and extended video and music playback with the ability to watch and listen to digital TV and radio. 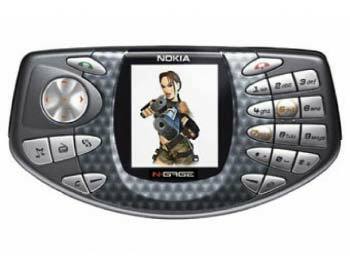 Convergence also led to the creation of hybrid game-phones like the Nokia N-Gage with form factors resembling handheld game consoles. The fundamental driver behind the trend of convergence is that mobile user experience is proportionally related to the functional scope of interactive mobile devices and systems: “more means more” (Murphy et al. 2005). As a consequence, convergence has often been criticised for generating weak general solutions with usability comparable to the Swiss army knife: clumsy technology with a wide range of functions, none of which are ideal in isolation (see e.g. Norman 1998, Bergman 2000, Buxton 2001). However, in my view the real strength of convergence should not be sought in the simple availability of several functions implemented in the same device. Rather it should be found in the potential creation of something new and hybrid that facilitates use that wasn’t possible before, like for example taking pictures and sharing them immediately with your friends, browsing the Internet on your phone, or purchasing music directly on your iPod. Contrasting the convergence approach, the trend of divergence suggested a single function/many devices or “information appliance” approach where each device is “designed to perform a specific activity, such as music, photography, or writing” (Bergman 2000). The driving force behind this line of thought is that having a wide range of good specialised tools is better than a general one that does not perform any task particularly well. Specialised tools facilitate optimisation of functionality over time and refinement of well-known paradigms of use. The fundamental view promoted by the trend of divergence is that mobile user experience is inversely proportionate to the functional scope of interactive mobile devices and systems: “less is more” (Murphy et al. 2005). Author/Copyright holder: Archos. Copyright terms and licence: All Rights Reserved. Used without permission under the Fair Use Doctrine (as permission could not be obtained). See the "Exceptions" section (and subsection "allRightsReserved-UsedWithoutPermission") on the page copyright notice. Author/Copyright holder: Sony. Copyright terms and licence: All Rights Reserved. Used without permission under the Fair Use Doctrine (as permission could not be obtained). See the "Exceptions" section (and subsection "allRightsReserved-UsedWithoutPermission") on the page copyright notice. 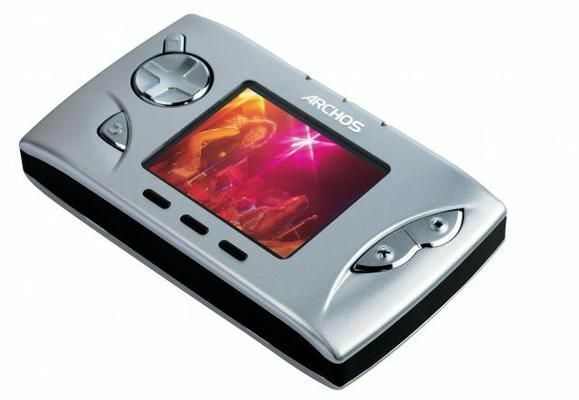 The 2000s saw the emergence a wide range of diverged mobile devices dedicated to do one specific task really well, particularly mobile music players, video players and games. Of course functionally dedicated mobile devices were not a new phenomenon as, for example, early mobile devices such as pocket calculators, cell phones, GPS receivers, digital cameras, and PDAs could unarguably be classified as information appliances too. But what was interesting about the trend of divergence in the early 2000s was that it was a deliberate interaction design choice and not a technological necessity. Probably the most legendary example of an information appliance was the Apple iPod from 2001. Although not the first mobile digital music player, its interaction design, including the integration with iTunes and later the iTunes Music Store, fundamentally changed global music consumption and purchasing behaviour. 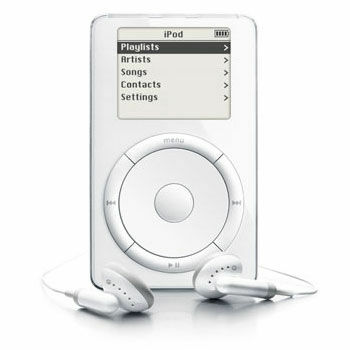 Although most mobile phones on the market in the mid-2000s were able to play MP3 files, people still preferred to carry an additional device, the iPod, for playing their music as it provided a better user experience for that particular task, and the device itself had become a popular fashion item. 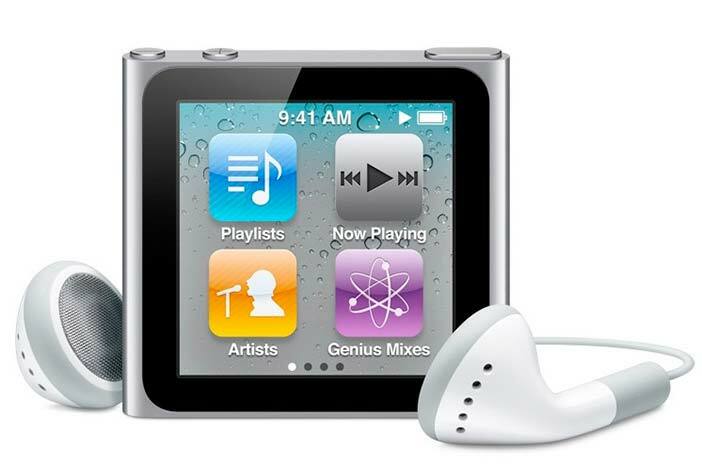 In late 2010, the total number of iPods sold had exceeded 290 million units. 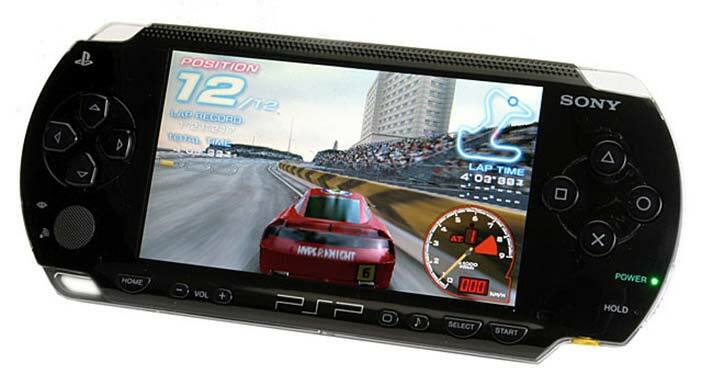 Other diverged mobile devices included video players like the Archos Gmini from 2004, the Sony PSP game and video console, and later versions of the iPod extended with video playback capability, but within the same basic information appliance interaction design. The interaction design challenge of a diverged mobile device is considerably different from that of a converged one because its functional scope is much narrower. However, as diverged devices are by definition typically used in concert with a plethora of other interactive devices and systems unknown to the designer, there is a huge interaction design challenge in supporting good and flexible integration and “convergence-in-use” (Murphy et al. 2005). In June 2007, Apple launched the iPhone. Like many of its contemporaries this was a converged mobile device functioning as a camera phone, portable media player, and Internet client with e-mail, web browsing, and high-speed wireless network connectivity. However, rather than being just another incremental step in the evolution of converged mobile devices, the iPhone represented a significant rethinking of the design of mobile interactions and a series of notable interaction design choices. It featured a large high-resolution capacitive multi-touch display with simple gesture capabilities, such as swiping and pinching, and departed completely from the predominant use of physical keys and a stylus for text entry and interaction. Instead of navigating large and deep hierarchies of menus, the user experience was much more fluid and aesthetic, and the phone was both extremely easy and pleasurable to use. The iPhone also featured a number of embedded context sensors, which changed the orientation mode of the display depending on how it was held, as originally proposed in a UIST conference paper by Hinckley et al. (2000), and it thereby changed the mode of the phone application when held close to the face during a call. The later inclusion of GPS and a digital compass extended this “context-awareness” capability to also enable location-based services. On the software side, the iPhone’s web browser actually made it possible to access web content on a mobile device with a positive user experience, and many soon described handling email on the iPhone as favourable compared to its desktop counterparts. Dedicated applications provided direct access to watching video content from YouTube and purchasing music from the iTunes Store. In concert, this meant that people actually started using their mobile device as a preferred gateway to the Internet, rather than as a last resort. Consequently, iPhone OS dominated the total amount of mobile web traffic worldwide by mid-2009 (Admob 2009). In addition to this, data and media content can be integrated seamlessly with the user’s other devices and computers at home or at work through cloud computing services such as MobileMe in a way never seen before in mobile interaction design, illustrating initial steps towards the creation of digital ecosystems of mobile and stationary computer systems connected through the Internet. 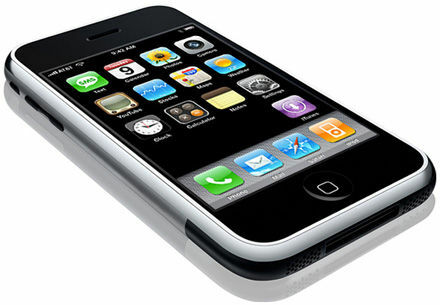 The iPhone completely redefined mobile computing and set new standards for mobile interaction design and user experiences that other companies, such as Google and HTC, still struggled to match up to 4 years later with the Android open source mobile operating system and associated online application store. In many ways, the iPhone was the device that mobile interaction design researchers had envisioned for a decade, and its enormous uptake worldwide, with over 120 million iOS enabled devices sold by September 2010, confirms that we were indeed right in our speculations about what people would want to do with mobiles — if only we could provide them with a good enough interaction design and user experience. The biggest impact of the iPhone, however, was not only in the interaction design of the device itself and in the high quality of its native applications. As it turned out, it was in the creation of an interaction design that provided users with easy access to a vast and unprecedented amount of applications for their mobile device. In 2008, Apple launched the online “App Store” which provided a mechanism by which iPhone users could easily download, and pay for, third-party application content directly from their mobile device. These Apps span a range of functionalities, including social networking, productivity tools, personal utilities, games, navigation, and advertising for movies and TV shows. For creating this application content, an iPhone OS software development kit (SDK) was released for free along with a business model where Apple handles payments and distribution while leaving App creators with 70% of the profit. By 2012, more than 25 billion Apps had been downloaded from a selection of more than 500.000, making this hugely profitable for both Apple and for the individual third-party creators of particularly popular Apps, which in return has motivated the creation of even more application content. As an indication of the incredible size of this business, third party mobile software developers generated a total income of $2 billion by selling their products through the Apple App store in less than three years. Contrary to developing mobile applications in Java 2 Platform, Micro Edition (J2ME) or Qualcomm’s Binary Runtime Environment for Wireless (BREW), developing in iPhone SDK involves no need for customizing applications for a vast range of different handsets, which means that more time can be spent on application design. Also, in sharp contrast to the generally horrific mobile phone user interfaces for installing especially J2ME software, the iPhone provides not only a supply chain and billing model out-of-the-box, but also an application shopping user experience that is positive in itself. Hence, prior to the iPhone, downloading and installing software onto a mobile phone or PDA was something only technology-savvy people would do. Today this is common practice for millions of users, no matter their age and computing experience. As an interesting effect of the iPhone-approach to mobile interaction design, improving the hardware specification of devices was suddenly surpassed in importance in favour of improving the software that is available for them. This is evidenced in the pace and scope of software developments and updates compared to equivalent hardware ones, which is an important shift within the design of mobile interactions. It indicates that a level of stability has been reached in terms of physical form factors and basic input and output capabilities, in favour of a focus on applications and content. Apple’s success with the iPhone led to a third endeavour within mobile computing, the iPad, which was released in April 2010. Initial media reaction was mixed, but commercial uptake was unprecedented, and the iPad was sold in over 2 million units in its first two months, reaching 15 million units sold by the end of the year. While Microsoft’s explicit interaction design approach for PDAs and tablets had long been to replicate the Windows 95 OS (Zuberec 2000), Apple took the opposite approach with the iPad tablet and based it on iPhone OS rather than MacOSX. This was a surprising move for many, admittedly including myself, but it had the effect of reinterpreting, and subsequently redefining, the so-far troubled category of “tablet computers” into a new category of mobile devices that are not just laptops without keyboards. 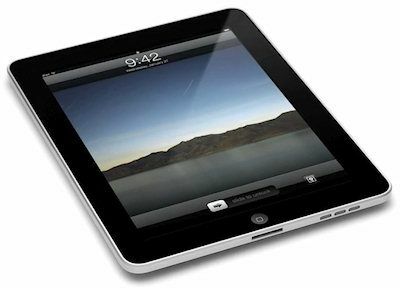 Although criticised for being a closed system, the strength of the iPad lay in the user experience created through its meticulous interaction design, which invited the already growing community of iPhone interaction designers and application developers to explore the tablet form factor. Until then, nobody had cared to create web or native application content for tablets (Chen 2010), but with the iPad, tablets suddenly became one of the most interesting and promising mobile platforms on Earth, and by March 2011 there were more than 65.000 applications available for the iPad. As we move into the second decade of the new millennium, the challenges facing mobile computing and interaction design continue to evolve. The technical capabilities of our mobile devices have improved significantly to the point where factors such as screen real estate, input capabilities, processing power, network speed, and battery lifetime are much less of an issue than only half a decade ago. At the same time, we have also become sufficiently skilled at designing for relatively small screens and for the different input capabilities of mobile devices so that millions of ordinary people are actually able to download and use the applications being developed, and are even willing to pay for some of them. To a large extent, therefore, we have now successfully solved the majority of problems facing mobile interaction researchers and designers in the past. However, as the history of all areas of computing have shown us, it is highly unlikely that we have reached an end point. As in the past, the technology and interaction design we are witnessing today is just the starting point for the continuing evolution of the technology and interaction design of tomorrow. But what are then the challenges and opportunities for the design of mobile interactions to come? What will the next wave of mobile computing be about? Fuelled by the enormous interest and uptake of “post-PC devices” like smart phones and tablets by the general population, it is not unreasonable to speculate that a major platform shift away from desktop computing is imminent. Mobile devices are becoming more and more important and widespread. They will soon be the dominating point of access to the Internet, and in combination with the growth of cloud computing they will soon dominate peoples’ use of computational power. Importantly, what we are witnessing here is not just the development of even smarter smart phones with improved abilities to imitate desktop PCs in miniature. It is a radical evolution of a major computing platform for new applications allowing us to do things that couldn’t be done before. This may well be a genuine paradigm shift for mobile computing and mobile interaction design. Looking on the current trends, it appears that the next wave of mobile computing and interaction design is going to be about the creation of digital ecosystems (Miller et al. 2010) in which mobile computing plays a central role in concert with other ubiquitous computing resources. This challenges us to move beyond considering interactive mobile devices, systems, and services as entities that can meaningfully be designed and studied in isolation from the larger use context or artefact ecologies (Jung et al. 2008, Bødker and Klokmose 2011) that they are a part of. Yes, mobile computers, in various forms, play hugely important roles in most peoples’ everyday lives, but they are not the only technologies and artefacts we make use of at home or at work, or in the space between. Most people use multiple mobile devices for different purposes, but they also use a multitude of stationary or embedded computer systems, at work, at home, in their cars, or in the city around them. In concert, this makes up a rich digital ecosystem of interactive devices, systems and services often referred to as ubiquitous or pervasive computing, in which mobile computing is a central, but not the only, component. The challenge of designing mobile interactions in such ubiquitous and pervasive information societies is to facilitate the creation of interactive devices, systems, and services that fit well into this ecosystem of other devices, systems, and services, as well as into the rich new use patterns, for work and leisure, created by these technologies and their users. Like any other type of ecosystem, understanding, creating, and maintaining digital ecosystems requires a holistic perspective on the totality and ecology of the system at play, and not just detailed views on each of its individual components. The digital ecology wave of mobile computing will build on the achievements of previous eras within hardware miniaturization, connectivity, new form factors, input devices, interaction styles, applications, convergence, divergence, and content, but it will broaden the scope to include the wider context of use and an explicit sensitivity for the contextual factors that influence the user experience. It is going to be about creating interactive devices, systems, and services that respond to the broad and diverse aspects of human life, and these not only provide utility and are easy to use, but also provide pleasure and fit naturally into peoples’ complex and dynamic lives of constantly changing settings and situations. The term interaction design, coined by Bill Moggridge and Bill Verplank in the late 1980s, is about “designing interactive products to support the way people communicate and interact in their everyday and working lives” (Sharp et al. 2007 p. 8), or more broadly about “the design of everything that is both digital and interactive” (Moggridge 2007 p. 660) with particular attention to its subjective and qualitative aspects. In other words, it is about creating life and work enhancing user experiences through the design, development, construction, and implementation of interactive products, devices, systems, and services. Today, interactive products are typically computer-based, and this means that interaction design is relevant within all disciplines, fields, and approaches that concern themselves with research and design of computer-based systems for people. Hence, alongside design practices such as graphic and industrial design, academic disciplines such as psychology and sociology, and multi/interdisciplinary fields such as human-computer interaction and information systems, interaction design also involves the technical academic disciplines of computer science and engineering. However, interaction design differs from each of these practices, disciplines, and fields by having a different, overall, focus and purpose. It is concerned with the totality of the user experience of interactive products and with all of the factors that may contribute to their successful creation. When we design computer-based interactive systems, we are not just designing how it appears, but also how it behaves. We are designing how people and technology interact (Moggridge 2007). As described by Winograd (1996), doing interaction design can in many ways be compared to doing architecture. The architect is concerned with people and their interactions within the building being created. For example, does the space fit the lives or work styles of the family or business that is going to inhabit it? Does the flow within and between rooms work well? Are functionally related spaces in close proximity? And so on. Supporting the work of the architect, engineers are concerned with the structural soundness and construction methods of the building, and knowledge from other disciplines, such as human factors and social sciences, may also influence the architect’s ability to create functional and liveable spaces. Just like a good architect understands these other relevant disciplines, so does a good interaction designer. However, just like there is a difference between designing and building a house there is also a difference between designing an interactive product and engineering its software (Sharp et al. 2007 p. 9). Mobile interaction design is an area of interaction design that is concerned specifically with the creation of user experiences with interactive products, devices, systems, and services that are not stationary, but that people can take with them. It is enabled by advances in mobile computing — as described earlier — that have allowed designers and system developers to conceive interactive products that are small enough to be carried with us, held in our hands, or even worn, while also providing computational power and network capabilities sufficient enough for enabling useful and attractive interactive systems and services. This includes handheld and wearable devices, PDAs, mobile phones, smart phones, portable digital media players, handheld games, etc. as well as the software applications and services that run on these devices or can be accessed from them. However, mobile interaction design is not only facilitated and driven by advances in computer science and engineering. It is also increasingly advanced by our ability to develop new use practices for mobile computing and to include and appropriate available and emerging mobile computer and network technologies into new and innovative interactive products and solutions. Hence, we have long ago gone beyond the “anytime anywhere” mobile computing hype of the late 1990s and grown much more sensible aspirations to develop “mobiles that work at the right time, and that know their place — that fit in” (Jones and Marsden 2006). The challenges of mobile interaction design have changed and evolved over time as new technologies were developed and new use practices emerged. Early mobile interaction design dealt with the physical design of portable computers. This evolved into a focus on input devices and interaction styles suitable for handheld operation and mobile use. For mobile phones, the interaction design challenge has primarily been a matter of reducing physical size while optimizing the use of limited display real estate and the standard 12-key numeric keypad for more and more possible applications. With the emergence of functionally hybrid and more complex devices, the interaction design challenge became about developing new forms and shapes of devices as well as developing new types of applications available on them, without making the devices (even) harder to use. For the growing range of functionally dedicated mobile devices like digital cameras and media players, the interaction design challenge became about facilitating peoples’ “orchestration” of all these devices, and their content, in increasingly complex ecosystems of interactive computer systems and digital data. Today, the challenge of designing mobile interactions is very much about the development of software applications. The physical device form factor appears to have stabilized, for some time at least, on the basic size, shape, and interaction capability introduced by the Apple iPhone in 2007, which has remained unchanged for more than four years and been replicated by all major handset producers. This has shifted focus towards downloadable and purchasable third party application content available for these devices, in the form of relatively small “Apps” with highly specialised functionality, designed not only by large software corporations, but also by small companies and even individuals, including students. By late 2010, more than 300.000 third party applications were available from the Apple App Store, and more than 80.000 were available from Google’s Android Market. In less than three years, more than 10 billion Apps were downloaded for the iPhone and iPod Touch. However, although a lot of interesting and innovative new mobile applications are appearing in Google’s and Apple’s online stores every day, and application developers and interaction designers worldwide are pushing the boundaries of what mobile computer devices are being used for, the state of current mobile application design can be compared to the state of the web in the mid-1990s. There is a lot of excitement and interest, the development tools are easily accessible, and there is a huge audience of potential users. Exceeding the potentials of the web in the mid- 1990s, there are even well established digital supply chains and mechanisms for micro-payments. But as with the web 15 years ago, we haven’t yet seen or understood the significance and scope of the impact that third party application design for mobile devices will have on all aspects of our lives, for work as well as for leisure. Since the early days of mobile computing and mobile human-computer interaction, the use contexts of interactive mobile systems and devices have often been highlighted as being particularly important for system developers to “be aware of” and “take into account” when designing and building interactive mobile systems, and when evaluating and studying their use (cf. Johnson 1998, Rodden et al. 1998, Brown et al. 2000). Mobile use contexts have been described as being particularly challenging compared to, for example, the use contexts of traditional stationary office systems due to their highly dynamic, complex, and indeed mobile, nature. 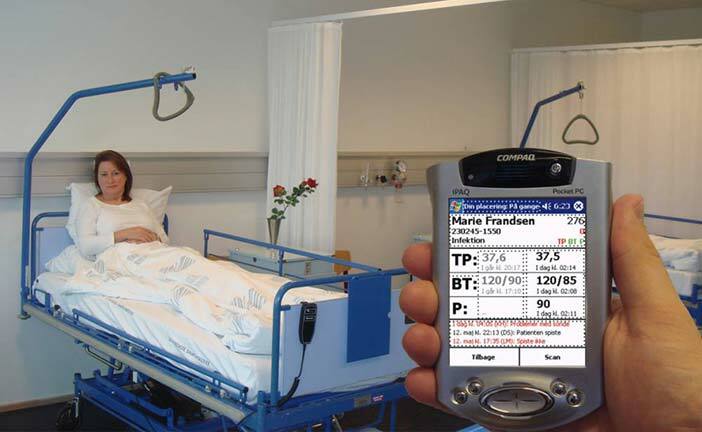 It has also often been suggested that when using an interactive mobile computer system, other activities in the surrounding context are often more important than the actual interaction with and use of the system itself — walking down the street, socialising in a bar or café, or attending to a patient in a hospital. There are many different definitions of context, and the debate on what constitutes context for mobile computing, and what role it plays, is ongoing. Early works within mobile computing referred to context as primarily the location of people and objects (Schilit and Theimer 1994). In more recent works, context has been extended to include a broader collection of factors such as physical and social aspects of an environment (McCullough 2004, Dourish 2004, Bradley and Dunlop 2002, Agre 2001, Dey 2001, Abowd and Mynatt 2000, Schmidt et al. 1999a, Crabtree and Rhodes 1998). Dey (2001) defines context as “any information that can be used to characterise the situation of an entity. An entity is a person, place or object that is considered relevant to the interaction between a user and an application, including the user and the application themselves.” Although this definition is quite complete, it is not very specific about what type of information could in fact be used to characterise such a situation. In contrast to this, Schmidt et al. (1999a) present a model of context with two distinct categories: human factors and physical environment. Human factors consist of the three categories: information about the user (profile, emotional state, etc. ), the user’s social environment (presence of other people, group dynamics, etc. ), and the user’s tasks (current activity, goals, etc.). Physical environment consists of the three categories: location (absolute and relative position, etc. ), infrastructure (computational resources, etc. ), and physical conditions (noise, light, etc.). This model provides a good catalogue of specific contextual factors to complement broader definitions like the one by Dey (2001). Other works are not as comprehensive in their coverage of different contextual factors, but go into detail about one or a few. In the works of Agre (2001) and McCullough (2004), particular importance is given to physical context consisting of architectural structures and elements of the built environment, for example, landmarks and pathways. In the works of Dourish (Dourish 2001, Dourish 2004), particular importance is given to social context including interaction with, and the behaviour of, people in an environment. Dourish (2004) also states that context cannot be defined as a stable description of a setting, but instead arises from, and is sustained by, the activities of people. Hence, it is continually being renegotiated and redefined in the course of action. These works provide us with additional contextual factors of particular relevance to mobile computing in context, and with the knowledge that what defines context is in itself contextually dependent. The context of mobile computing is something that several individual disciplines within mobile interaction design are concerned with, and that has influenced the shaping of methodology, technology, and theory within and across the field’s internal disciplinary boundaries. These different disciplines have each approached the challenge of contexts differently, and have yielded different types of responses. In domain studies of mobile computing, where context plays an obvious central role as essentially the phenomenon under scrutiny, the challenge has been partly to understand theoretically what use contexts are and how they can be described, and partly to study empirically what characterises specific use contexts of interest, and how the phenomenon of context can be studied and analysed in ways that generate such understanding. This has led to a body of theoretical and socio-technical research building largely on methods and theories from sociology, anthropology, and phenomenology (e.g. Luff and Heath 1998, Dourish 2001, Dourish 2004, Dey 2001, Ling 2001, Perry et al. 2001, Fortunati 2001, Green et al. 2001, Agre 2001, McCullough 2004, Chalmers 2004, Aoki et al. 2009, Kostakos et al. 2009), as well as my own work in this area (Paay and Kjeldskov 2005, Paay and Kjeldskov 2008a, Kjeldskov et al. 2004, Kjeldskov and Stage 2006). In systems development and design for mobile computing, the challenge of context has primarily been about creating an appropriate fit between systems and context and how this can be supported structurally through new, or modified, systems development and design methods. While relatively very little has been published on this topic, there is an emerging body of methodological research building largely on methods and theories from information systems, software engineering and human-computer interaction (e.g. Sharples et al. 2002, Mikkonen et al. 2002, Hosbond 2005, Paay 2008, de Sá and Carrico 2009, Paay et al. 2009a), as well as my own work (Kjeldskov and Howard 2004, Paay et al. 2009b, Vetere et al. 2005, Kjeldskov and Stage 2012). In usability evaluation for mobile computing, the challenge of context has primarily been to understand its role in relation to the scope, richness, and validity of empirical findings and how usability tests can be carried out in contextually realistic settings through use of new or modified methods and techniques. This has led to a growing body of empirical research building largely on methods and theories from usability engineering. These include, for example (Brewster 2002, Betiol and Cybis 2005, Hagen et al. 2005, Kaikkonen et al. 2005, Nielsen et al. 2006, Rogers et al. 2007, Reichl et al. 2007, Oulasvirta 2009, Oulasvirta and Nyyssonen 2009, de Sá and Carrico 2010), as well as my own contributions (Kjeldskov and Stage 2004, Kjeldskov et al. 2004, Kjeldskov et al. 2005, Kjeldskov and Skov 2007a, Høegh et al. 2008). In implementation of mobile computing, the challenge of context has largely been about capturing, formalizing, and modelling this attribute in computational data models, how to make sense from such models, and how to use them in the construction of context-aware mobile systems that are responsive to their surroundings. This has led to an extensive body of technical research building largely on methods and theories from computer science (e.g. Schilit and Theimer 1994, Crabtree and Rhodes 1998, Schmidt et al. 1999a, Schimdt et al. 1999b, Cheverst et al. 2001, Dix et al. 2000, Chen and Kotz 2000, Hinckley and Horvitz 2001, Dey 2001, Jameson 2001, Jones et al. 2004, Edwards 2005, Hinckley et al. 2005), as well as my own contributions (Kjeldskov and Skov 2007b, Kjeldskov and Paay 2005, Kjeldskov and Paay 2006, Kjeldskov et al. 2010, Skov et al. 2012, Kjeldskov et al. 2012). In user experience research for mobile computing, the challenge of context has been to understand what impact rich and dynamic user contexts have on peoples’ experience of using technology, and to describe how this user experience can be improved. This has led to a body of theoretical, conceptual, and design-oriented research building on methods and theories from a wide range of disciplines from sociology and psychology to cognitive science, computer science, human-computer interaction, and computer-supported cooperative work. These include, for example (Abowd and Mynatt 2000, Cheverst et al. 2001, Palen et al. 2000, Weilenmann 2001, Bradley and Dunlop 2002, Brown and Randell 2004, Little and Briggs 2009, Benford et al. 2009, Karapanos et al. 2009, Lindley et al. 2009, Rowland et al. 2009), as well as my own contributions (Paay and Kjeldskov 2008b, Kjeldskov and Paay 2010, O’Hara et al. 2011, Murphy et al. 2005). This is not to say that context is a new phenomenon appearing on the research agenda with the emergence of mobile computing. Context has indeed been an important concept within human-computer interaction and interaction design since the second wave or paradigm of HCI (Bødker 2006, Harrison et al. 2007). The first wave of HCI was a mixture of engineering and human factors focussing on optimizing human-machine fit. The second wave was largely based on cognitive science focussing on the simultaneous processing of information in machines and in the human mind, but this also involved a strong focus on the use of interactive computing systems in the context of the workplace. However, as pointed out by Bødker (2006), while there was lot of discussion about the intricate concept of context in second wave HCI, this research achieved little in terms of defining and operationalising it in a way of any real significant value to HCI and interaction design. In the third wave, focus has broadened further towards a post PC ubiquitous and pervasive information society where computer technology has spread “from the workplace to our homes and everyday lives and culture” (Bødker 2006). This means that context is now an elemental concept that we not only need to define well, but also need to understand better in terms of its complexity, significance, and influence on peoples’ experience of technology in use, in order to inform technology design better. Mobile interaction design is positioned within the second and third waves of HCI. It grew out of the second wave, but the tremendous uptake of mobile computing by the general population subsequently was a contributing factor to the creation, force, and velocity of the third wave by enabling some of the completely new potentials and patterns of computing technology use that we are witnessing globally today. Much of the future impact of mobile computing envisioned earlier will be driven by skilful and creative design of mobile interactions conceived by entrepreneurial developers and designers who understand how to create useful and enjoyable utility and user experience that fits the user’s needs, desires and contexts of use. Unfortunately, however, the current research-based literature on mobile interaction design neither provide as much foundation as we probably could for these developers and designers to base their innovations and interaction design on, nor much methodological guidance on how to approach the process. Whereas there are a lot of research-based books about user interface and interaction design for desktop applications and web sites, there is not yet a lot of equivalent literature available about mobile interaction design. Although mobile computing has a history of approximately three decades, and interaction design has played an important role throughout about 2/3 of this history, only one good general textbook, by Jones and Marsden (2006), has been published on the topic to date. And although this book is indeed a brilliant starting point for addressing the particular challenges of mobile interaction design, it still doesn’t have the completeness and depth of equivalent human-computer interaction and interaction design primers such as Laurel (1990), Shneiderman (1997), Preece et al. (1994), Winograd (1996), Raskin (2000), Dix et al. (2004), Benyon et al. (2005), Lauesen (2005), Bagnara and Smith (2006), Preece et al. (2002), and Rogers et al. (2011). This is potentially an opportunity missed for large-scale real-world impact on mobile interaction design practice in respect to the massive amount of good interaction design research that has been done within the field over the last decade and a half. While it might indicate that the area of mobile interaction design still hasn’t stabilized enough for general guidelines, principles, methods, and techniques to evolve, it also demonstrates an opportunity, and a need, to push forward on developing such foundational work further. 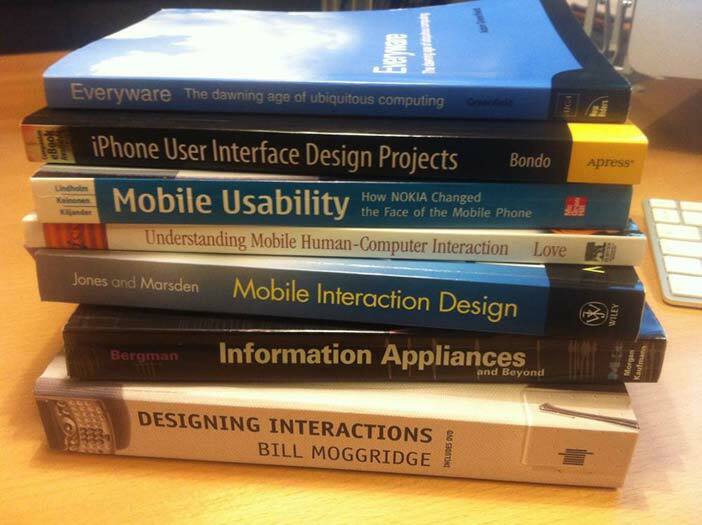 Several of the textbooks that do exist on aspects of interaction design for mobile devices, systems, and services, such as Helal et al. (1998), Weiss (2002), Ballard (2007), Fling (2009) and Frederick and Lal (2010), essentially target application development for particular and very specific classes of devices and software platforms, and address ephemeral technical limitations, such as particular operating systems, low screen resolution, reduced processing power, limited memory, and poor bandwidth. While unarguably useful when designing for these exact platforms, the weakness of such types of works is that they are almost too practical. They are highly vulnerable to technological advances and therefore quickly rendered irrelevant as new devices and platforms emerge. As a consequence, they usually end up as short-lived and overly specific user interface guidelines tied to a specific point in time, and not as generally applicable and timeless principles for interaction design. Distilling the essence of these works — the higher-level challenges and solutions that apply beyond specific devices and platforms — would be useful for moving the field of mobile interaction design forward. But such work has not yet been done systematically and in depth. As a step in the right direction, though, a different class of textbooks on mobile interaction design is the collection of case study-like accounts for successful and influential design solutions, such as Eric Bergman’s “Information Appliances and Beyond” (Bergman 2000), Lindholm and Keinonen’s “Mobile Usability: how Nokia changed the face of the mobile phone” (Lindholm and Keinonen 2003), parts of Bill Moggridge’s “Designing Interactions” (Moggridge 2007), and Bondo et al’s “iPhone User Interface Design Projects” (Bondo et al. 2009). These writings aim to capture universally important lessons learned from the experience of actual mobile interaction designers. They provide interaction design as well as methodological insight about influential solutions and how they came about. The potential weakness of these works, however, is that they easily end up being anecdotal and difficult to transfer into present time’s design challenges. To support such transfer and transcendence of knowledge, we must provide not only the case study accounts, but also analysis across these case studies that elevates our learning from the concrete and specific level to the abstract and general. So where do we go from here? As I have discussed earlier, the currently emerging trend within mobile computing is the creation of digital ecosystems where interactive mobile systems and devices are viewed less in isolation and more as parts of larger use contexts or artefact ecologies (see, for example, Jung et al. 2008, Bødker and Klokmose 2011). From my perspective, this is an avenue for further research and design that is particularly interesting, and one that I personally look forward to engaging myself in more deeply. As a starting point for this, I believe that we need to develop interaction design approaches that focus more broadly on “the whole” and have a build-in sensitivity for the continual emergence and convergence of systems and their context that characterises such ecosystems and ecologies. Contemporary interactive mobile systems, services, and devices have become integral parts of ubiquitous computing environments that we care deeply about. However, although their look, feel, and features impact our everyday lives as we orchestrate them in concert with a plethora of other computing technologies, these artefacts and ecosystems are not well understood or created through traditional methods of user-centred design and usability engineering. Contrary to more traditional IT artefacts, they constitute holistic user experiences of value and pleasure that require careful attention to the variety, complexity and dynamics of their usage. Hence, we need further development of theoretical and conceptual lenses through which we can view, address, and describe this emerging phenomenon in a way that informs and inspires design and further thinking. This work may find inspiration and traction in some of the conceptually stronger and less technical literature on ubiquitous and pervasive computing that has started to appear in recent years, such as Adam Greenfield’s book “Everyware” (Greenfield 2006). As a way of encapsulating and labeling this work, I suggest to use and develop the term digital ecology. Ecology is the study of elements making up an ecosystem, and is very generally about understanding the interactions between organisms and their environment. It is inherently holistic and has an interdisciplinary nature, and it is not synonymous with “the environment” or with “environmentalism”. Nor is ecological thinking limited to the discipline of biology. For example, “industrial ecology” studies material and energy flows through networks of industrial processes, and “human ecology” is an interdisciplinary area of research that provides a framework for understanding and researching human social interaction. In a similar fashion, I believe “digital ecology” may be a useful way of describing the study of elements making up digital ecosystems and the holistic understanding of interactions between these elements and their environment. By digital ecology is thereby meant the study of interrelated digital systems (e.g. mobile and pervasive computing) and the processes by which these systems work and interact, and are conceived, emerge, converge, and evolve. It is about understanding the functioning, use and experience of digital ecosystems and artefact ecologies around us, and the design processes that create and advance them. There are several online sources for more information. Some are available for free, while others require a subscription or accessing them from within subscribing universities’ networks. The Mobile HCI conference series is a central place to go for more information. Proceedings from the conference series are available electronically through Springer and ACM. Mark Dunlop, one of the initiators of the conference series, keeps a general page on the conference at and there is also a page on Wikipedia http://en.wikipedia.org/wiki/MobileHCI worth visiting as a gateway. In addition to these, it’s worth browsing the Proceedings from the UbiComp conference series, the MobiCom conference series, and the Pervasive conference series). From the references below, I particularly recommend these articles and books. Atkinson, P. (2005) Man in a Briefcase - The Social Construction of the Laptop Computer and the Emergence of a Type Form. Journal of Design History, 18(2), 191-205. Bergman E. (Ed.) (2000) Information Appliances and Beyond. San Francisco: Morgan Kaufmann Publishers. Greenfield, A. (2006) Everyware: the dawning age of ubiquitous computing. Berkeley: New Riders. Hinckley, K., Pierce, J., Sinclair, M. and Horvitz, E. (2000) Sensing techniques for mobile interaction. In Proceedings of UIST 2000 (pp. 91-100). New York: ACM. Johnson, P. (1998) Usability and Mobility; Interactions on the move. In Proceedings of the First Workshop on Human-Computer Interaction with Mobile Devices, Glasgow, Scotland (GIST Technical Report G98-1). Jones, M. and Marsden, G. (2006) Mobile Interaction Design. Glasgow: John Wiley and Sons, Ltd.
Kay, Alan (1972). A Personal Computer for Children of All Ages. In Proceedings of ACM National Conference. Boston: New York: ACM. Paay, J., (2008) From ethnography to interface design. In J. Lumsden (Ed. ), Handbook of Research on User Interface Design and Evaluation for Mobile Technology (pp. 1-15). PA, USA: Idea Group Inc (IGI). Perry, M., O'Hara, K., Sellen, A., Brown, B. and Harper, R. (2001) Dealing with mobility: understanding access anytime, anywhere. ACM Transactions on Computer-Human Interaction, 8(4), 323-347. Rogers, Y., Connelly, K., Tedesco, L., Hazlewood, W., Kurtz, A., Hall, R. E., Hursey, J. and Toscos, T. (2007) Why it's worth the hassle: the value of in-situ studies when designing Ubicomp. In Proceedings UbiComp 2007, LNCS (pp. 336-353). Berlin: Springer-Verlag. Weiser, M. (1991) The Computer for the 21st Century. Scientific American, 265(3), 94-104. Kjeldskov, J., Skov, M. B., Nielsen, G. W., Thorup, S. and Vestergaard, M. (2012) Digital Urban Ambience: Mediating Context on Mobile Devices in the City. Journal of Pervasive and Mobile Computing (in press). Kjeldskov J., Cheverst K., de Sá M., Jones M., and Murray	-Smith R. (2012) Research Methods in Mobile HCI: Trends and Opportunities. Proceedings of Mobile HCI 2012 (vol. 2), September 21-24, San Francisco, USA. ACM Press, pp. 255-260. Kjeldskov J. and Paay J (2012) A longitudinal review of Mobile HCI research Methods. Proceedings of Mobile HCI 2012, September 21-24, San Francisco, USA. ACM Press, pp. 69-78. Kjeldskov, J. and Paay, J. 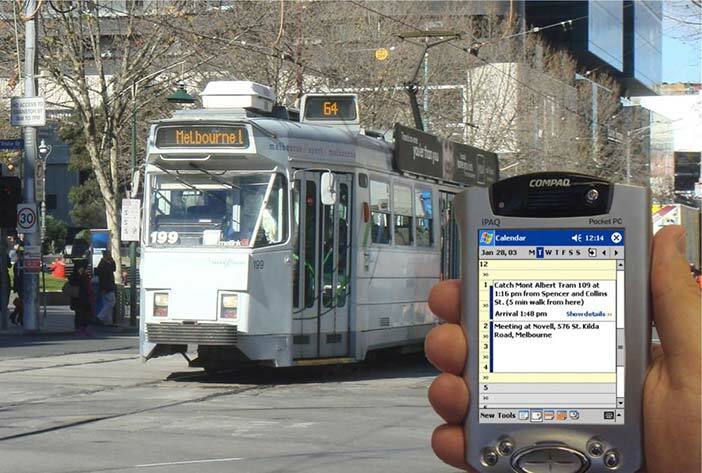 (2006) Public Pervasive Computing in the City: Making the Invisible Visible. IEEE Computer, 39(9), 60-65. Kjeldskov, J. and Paay, J. (2005) Just-for-Us: A Context-Aware Mobile Information System Facilitating Sociality. In Proceedings of Mobile HCI 2005, Salzburg, Austria (pp. 23-30). New York: ACM. Kjeldskov, J., Graham, C., Pedell, S., Vetere, F., Howard, S., Balbo, S. and Davies, J. 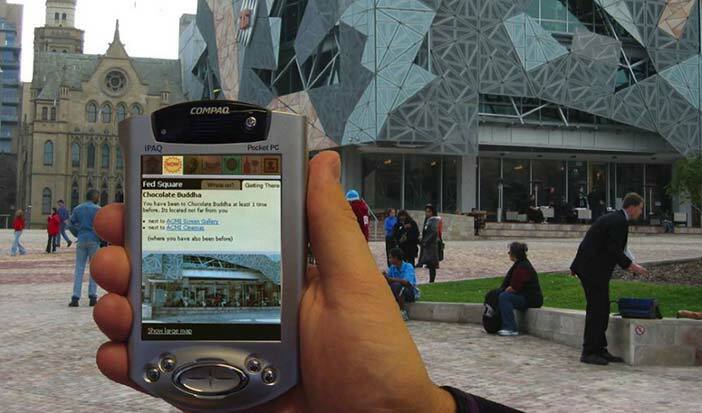 (2005) Evaluating the Usability of a Mobile Guide: The influence of Location, Participants and Resources. Behaviour and Information Technology, 24(1), 51-65. Kjeldskov, J., Skov, M. B., Als, B. S. and Høegh, R. T. (2004a) Is it Worth the Hassle? Exploring the Added Value of Evaluating the Usability of Context-Aware Mobile Systems in the Field. In Proceedings of MobileHCI 2004, Glasgow, Scotland, LNCS (pp. 61-73). Berlin: Springer-Verlag. Kjeldskov, J. and Stage, J. (2004) New Techniques for Usability Evaluation of Mobile Systems. International Journal of Human-Computer Studies, 60(2004), 599-620. Kjeldskov, J. and Graham, C. (2003) A Review of MobileHCI Research Methods. In Proceedings of the 5th International Mobile HCI 2003 conference, Udine, Italy, LNCS (pp. 317-335). Berlin: Springer-Verlag. Paay, J., Kjeldskov, J., Howard S. and Dave, B. (2009) Out on the town: a socio-physical approach to the design of a context aware urban guide. Transactions on Computer-Human Interaction, 16(2), 7-34. Jesper Kjeldskov is Associate Professor in Human-Computer Interaction at Aalborg University's Department of Computer Science. Jesper's research interests are Interaction Design and User Experience with particular focus on mobile and ubiquitous technologies in non-work settings. 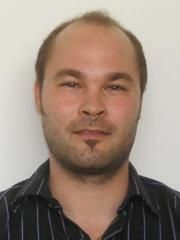 Jesper has a cross-disciplinary background spanning the humanities, social sciences and computer science. He has published more than 120 peer-reviewed papers within the area of Human-Computer Interaction including more than 20 articles in international journals. 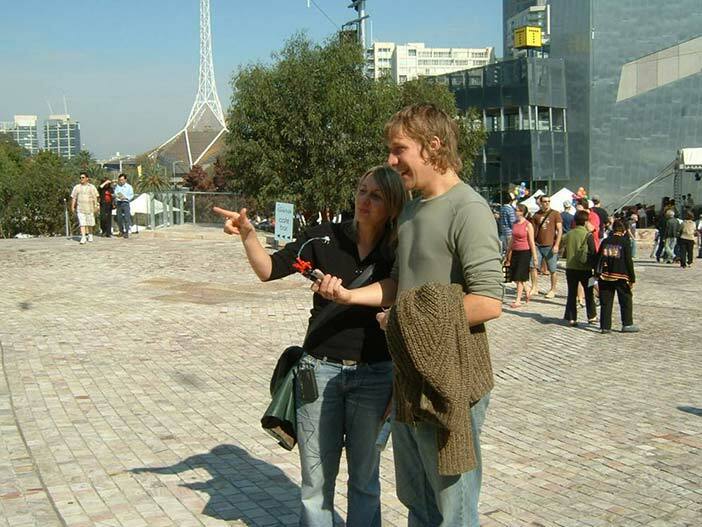 In 2008-09 Jesper was the research leader of a User Experience Research group in Sydney, Australia leading a multi-million dollar research project on Blended Interaction Spaces. Since 2009 he has revisited his interests in mobile HCI but also extended his work on domestic computing with new projects within sustainability, digital media, mediated relationships and interior architecture.